Our unique tumbler design actually speeds up the composting process. The key is having your organic materials contained so that a heat core can be built quickly. The dimensions of the Mantis® ComposTumbler® have been precision engineered for maximum efficiency in building a superior heat core. As the drum of the ComposTumbler is turned, the materials inside the composter mix and the core is stable. Air flow and moisture balance are essential. When this balance is right, the compost gets hot. Millions of microbes release heat as they decompose the organic matter in the composter. This process is called “hot composting” and the elevated temperatures in hot composting produce finished compost FAST. The ComposTumbler is designed with air vents on the sides of the drum and on the door so air flow is unimpeded during composting. Drainage units on the door allow for any excess moisture to escape so materials won’t get soggy. The result is a perfectly balanced, self-contained composting system that turns organic throw-outs into perfect compost in just a few weeks. There are FIVE Mantis composter models available – one perfect for every household. Just collect a variety of organic waste materials from your yard, property and garden. Put them in your ComposTumbler composter, close the door, and immediately give the tumbler 5 turns. a day. No heavy lifting! 3. Finished Compost in Just a Few Weeks! Open the door and and tumble out organically rich finished compost. The Rusted Garden shows how to make compost via the hot composting method using a Mantis Back Porch ComposTumbler. Be sure the mix of ingredients you put in your tumbler contains wastes high in nitrogen and carbon for a good balance. Do not attempt to make compost using any products that have been treated with chemical fertilizers or pest control products. If you have bulky items to compost, such as corn cobs, melon rinds and shrub clippings, run them through a shredder before putting them in your composter. What Else Can You Add to Your Compost? You can add almost any organic material to your compost, and in small quantities you’re unlikely to upset the balance of “greens” and “browns.” Click below to download a list things you can compost. Healthier soil, better plants and contributing to a natural environment are all benefits of making compost with a Mantis ComposTumbler. Making compost is a great way to recycle. Instead of sending kitchen and garden wastes to the landfill, turning them into compost recycles them back into nature’s environment as a high-powered natural fertilizer. Compost makes hard clay soil more airy so it drains better and provides a healthier base for roots of plants. Your own home-made compost is completely safe and natural. It will not harm kids, pets, or the environment. Compost builds humus in your soil and improves soil structure, texture, fertility, drainage, and aeration. Compost is a mega-boost for plants. They grow bigger, produce bigger yields, and more beautiful flowers. Compost makes your plants more resistant to disease. Compost bulks-up thin, sandy soil, giving it more substance and texture to support hardy root growth. Use compost to top-dress new and existing lawns for thicker, healthier grass. On a newly seeded lawn, spread a thin layer of compost as top dressing. For an existing lawn, aerate first then spread the compost. 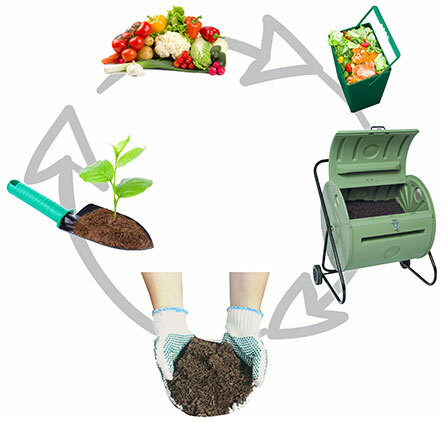 Composting creates a harmonious, natural balance in your yard and garden. Compost is that wonderful combination of microscopic mineral particles and decomposed organic material that makes your garden thrive. Composting is what gardeners do to control, or assist, the naturally occurring decaying of organic matter. In the forest, leaves, plant, fruits and nuts, animal waste, and other organic matter decay over time to return to the soil. This process continuously replenishes the soil with the nutrients essential for plant growth. But, natural or unassisted organic decomposition is usually relatively slow. Moisture content is inconsistent; the decaying plants, leaves, and animals can be relatively large; and the mix of materials in any given area can be somewhat unbalanced. Turning your composting bins eliminates the problems associated with slow decomposition. To make great compost in a relatively short time, you need a good combination of materials, adequate moisture, critical mass, and help from nature (microbes, worms, and other bugs). Redistributes moisture throughout the mix, since the outside of the mixture dries out quickly, especially in the summer. Redistributes the microbe population (and worms, if you have them) to fresh food supplies, where they will digest the organic materials and reproduce. Helps maintain a balance of green and brown materials (assuming you started with, and have maintained, a good mixture). Breaks up clumps, so that smaller particles are available for the bugs and worms that turn raw organic matter into compost. MANTIS COMPOSTERS MAKE TURNING EVEN EASIER. STRIVE FOR SMALL PARTICLES. You’ll make better and faster compost if you add small particulate matter to your composting bins. Shredded dry leaves are much better than whole leaves. Coffee grounds are great. Grass clippings should be mixed with leaves, if possible, to prevent clumping. Chop up any stalks from tomato plants or any whole fruits. The little microbes and worms prefer smaller particles (their mouths are much smaller than ours! ), and turning a large batch of small particles is much easier. Just like your garden soil, your composting mix needs the right amount of moisture for optimum performance. Not too wet; not too dry. If your mixture is very dry… consisting of a large amount of dry shredded leaves, for example, add water. Turn the composting bins to distribute the water throughout the mix; then, turn the composting bins so that the ventilation/drainage vents are on the bottom. Excess moisture will leak out of the vents. Be careful to avoid over-watering; a waterlogged mix will be harder to turn. While Mantis composters are easy to turn, and will mix the ingredients quite well, it may be necessary to break up some stubborn clumps by hand. If you’ve added a lot of grass clippings, they may form clumps or mats. Simply reach inside the composter bin to break up and mix any clumps. Using only well shredded or chopped up materials should eliminate any need to break clumps by hand; but, some folks actually like to get a close look at their composting activity. Remember that whenever you add new material to one of your composting bins, you’re resetting the composting clock to “day 1.” If, however, you take several days or even a couple of weeks to fill the first composting bin, just be sure to give the composting bin a few turns every time you add fresh materials. Do You Really Need to Turn the Composting Bins Every Day? No. Turning your composting bins every day is ideal, but not absolutely necessary. Composting should be fun, not work. If you miss a day or two, don’t give up. Just get back to turning the composting bins soon. With the right mix of composting materials, adequate moisture, and frequent mixing, you’ll soon have sweet-smelling, wonderfully nutritious, disease-fighting compost working in your garden! Start composting with Mantis today!